Richard Charles Rodgers (June 28, 1902 - December 30, 1979) was an American composer. His lasting fame rests on the blockbuster Broadway musicals he wrote with Oscar Hammerstein II. These include Oklahoma!, Carousel, South Pacific, The King and I, the television musical, Cinderella, and The Sound of Music. Rodgers was the first person to win all four top show business awards: an Emmy, a Grammy, an Oscar, and a Tony. He also won a Pulitzer Prize. Rodgers was born in New York City to Dr. William Rodgers and his wife, Mamie, who were of German Jewish descent. The family enjoyed musicals and opera. At 15, Rodgers chose music as his profession. He attended Columbia University, and wrote for the school's Varsity Show. 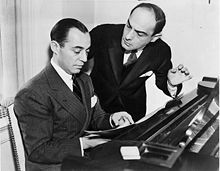 Rodgers, Lorenz Hart, and Oscar Hammerstein II all attended Columbia University. At Columbia, Rodgers joined the Pi Lambda Phi fraternity. In 1921, Rodgers changed his studies to the Institute of Musical Art (now Juilliard). Rodgers was influenced by composers such as Victor Herbert and Jerome Kern. Late in life, Rodgers established scholarships and other awards for students of The Juilliard School of Music, the American Theater Wing and the American Academy of Dramatic Art. In 1919 Rodgers met Lorenz Hart. The two wrote 26 musicals together, and song standards such as "I'll Take Manhattan", "My Funny Valentine", and "Bewitched, Bothered, and Bewildered". Their first professional production was the 1920 Poor Little Ritz Girl. In 1925 they became well known for the song "Manhattan". The duo then wrote several hit shows for both Broadway and London. Because of the Depression in the 1930s, they went to work in Hollywood. In 1935, they returned to Broadway. They wrote an almost unbroken string of hit shows. This ended with Hart's death in 1943. In 1942, Rodgers teamed up with Oscar Hammerstein II. They made the most successful partnership in American musical theatre history. Their first musical was the hit Oklahoma!. The team went on to create four more of the most popular musicals to date: Carousel (1945), South Pacific, The King and I (1951), and The Sound of Music (1959). All four were made into popular films. 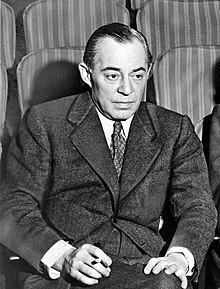 Rodgers and Hammerstein musicals earned a total of 35 Tony Awards, 15 Academy Awards, two Pulitzer Prizes, two Grammy Awards, and two Emmy Awards. Rodgers, Hammerstein, and Joshua Logan won the Pulitzer Prize for Drama for South Pacific. Rodgers and Hammerstein also won a special Pulitzer Prize in 1944 for Oklahoma!. After Hammerstein's death in 1960, Rodgers wrote both words and music for his first new Broadway project. Rodgers went on to work with lyricists Stephen Sondheim and Sheldon Harnick. Rodgers married Dorothy Feiner in 1930. They had two daughters, Mary and Linda. Mary is the composer of Once Upon a Mattress and an author of children's books. Her son Adam Guettel won a Tony Awards for Best Score and Best Orchestrations for The Light in the Piazza in 2005. Rodgers died in 1979. He was cremated, and his ashes scattered at sea. Richard Rodgers is a member of the American Theatre Hall of Fame. ↑ Nicole Lyn Pesce; Joe Dziemianowicz and Margaret Eby (3 March 2014). "Oscars 2014: Bobby Lopez becomes youngest person to get an EGOT with Best Original Song win for 'Let It Go'". New York Daily News. Retrieved 15 March 2014. ↑ "Drama". The Pulitzer Prizes. Retrieved 2013-12-03. This page was last changed on 8 March 2019, at 14:58.